Kickstarter seems to be the number one choice for upstarts with a smartwatch in mind to seek funding these days. Agent “the world’s smartest watch” is the latest in a long line that includes tech darlings like the Pebble. And actually, this new Agent watch seems like nothing more than a thicker (and potentially uglier depending on your taste in watch designs) version of the Pebble, but with one difference – it has Qi wireless charging built in. The promo video shows a watch with a “Memory” display that’s a combination of an e-paper and LCD displays, that can be paired with your phone and used to tell the time, show weather, control music players, act as a pedometer, and show you incoming calls or messages. After watching the promo video we have included below, I’m sure you’ll understand why we are drawing the Pebble comparisons. The creators of the Agent also teamed up with a watchmaker to come up with the design, which again is…interesting. Contrast stitching in 2013? OK. How thick is this bad boy? We heard comments from readers who thought the Pebble was oversized, so I can’t imagine what they’ll think of this one. If you’d like to back this project, the early bird special will run you $129, but will jump up to $149 afterwards. 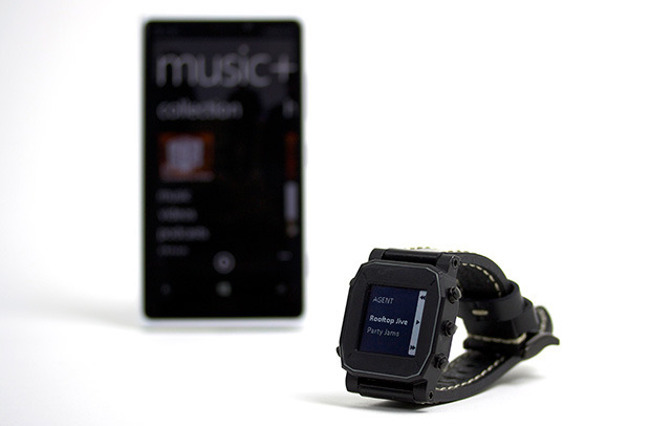 See any reason to pick this over the Pebble? I don’t.